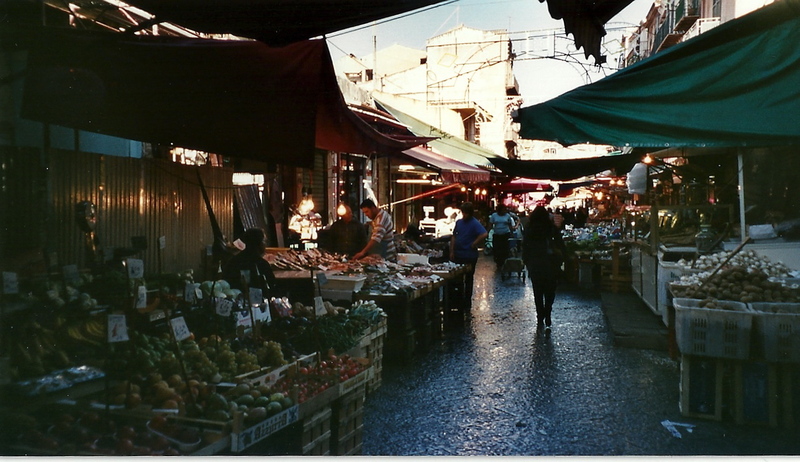 I enjoyed the second episode of Sicily Unpacked last Friday as much as the first and even got out an old album of photos of my holiday in Sicily with my daughter nine years ago. 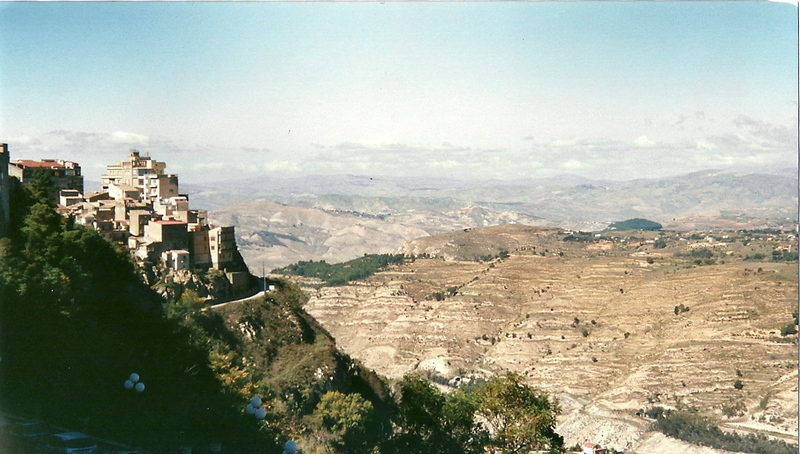 We went to Enna too, a town right in the middle of the island and also the highest, giving magnificent views right across Sicily in all directions. We were there in October, so the ground was dry and brown from the summer, making the vista look almost like a desert. 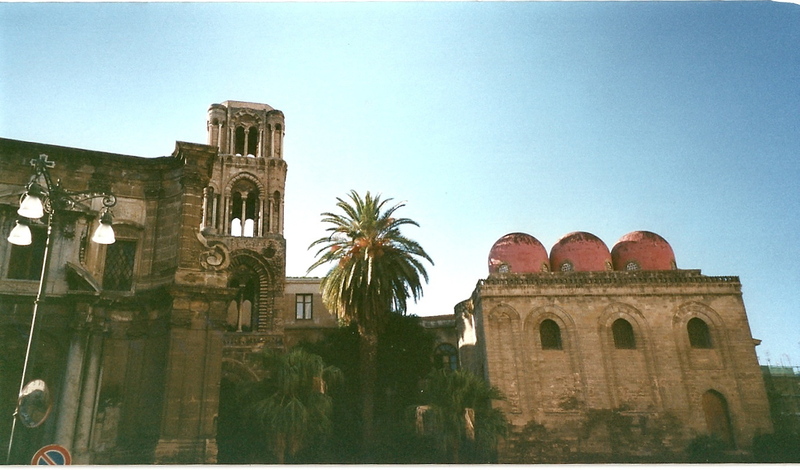 The really exciting place for me though was Palermo. It was slightly scary, two women on their own, with an edge of danger if you went down the wrong street; one can move from one road to an adjacent one and find a completely different atmosphere. When we got lost in the wonderful Vucciria market we ended up studying a map in a church and then seeking help from a nearby newsagents. 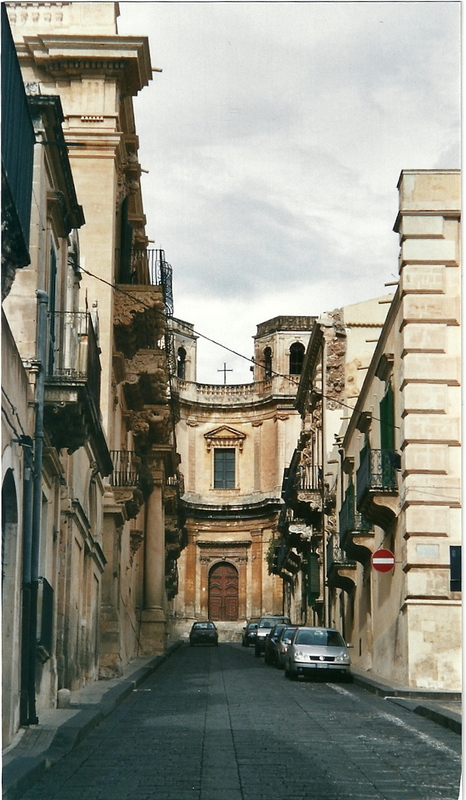 There was some wonderful architecture in the city, showing the rich diversity of Sicily’s heritage – and the influences of the different people who have invaded it. Not surprisingly all this has got me thinking more Sicilian recipes; even after the Drowned Cauliflower a few days ago, I craved more southern Italian cooking. 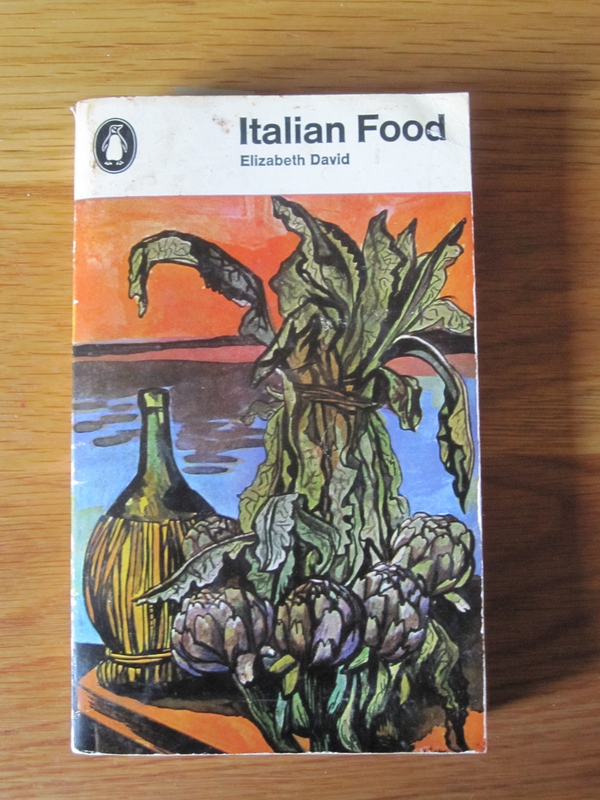 After watching Andrew Graham-Dixon read from Elizabeth David’s Italian Food while Giorgio cooked a caponata, I got out my own copy of the book – exactly the same with the illustrations by Renato Guttuso, whose wonderful painting of the Vucciria market they looked at in the first episode. It was a reminder of the extraordinary passion and vision of Elizabeth David and also, of course, the staying power of her recipes. They are as valid now as ever and bring authenticity to our kitchens. 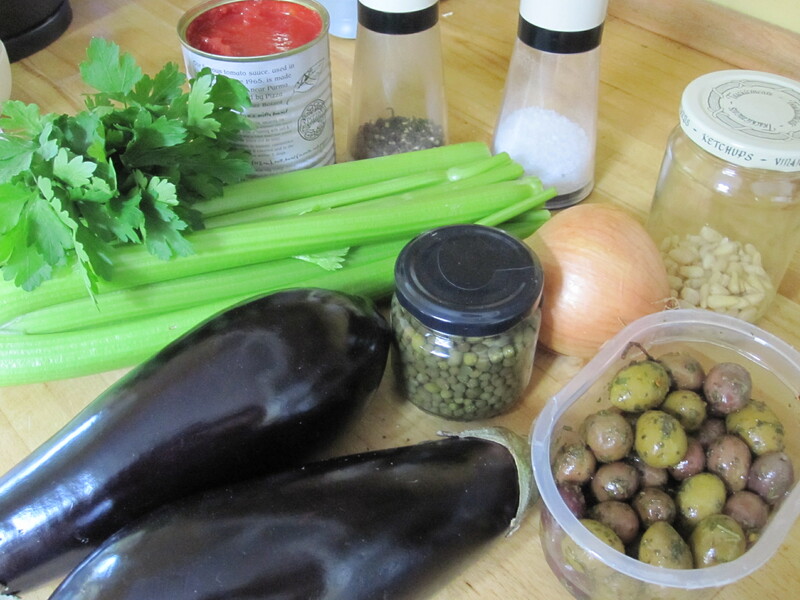 Though I was tempted to add a little courgette and some sweet peppers to my caponata as Andrew and Giorgio did, I decided to stick to David’s method – with a little help from Antonio Carluccio’s Vegetables book; his recipe is almost exactly the same as hers. Dice 2 aubergines and put them in a colander, sprinkle with salt and leave for 30 minutes. Then wash off salt and dry. 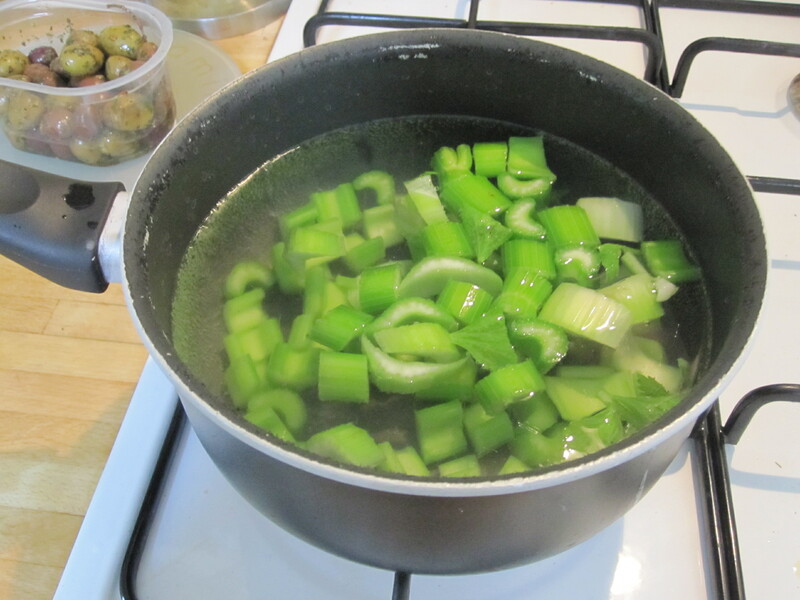 Chop half a head of celery and blanch in boiling salted water for 2 minutes and drain. 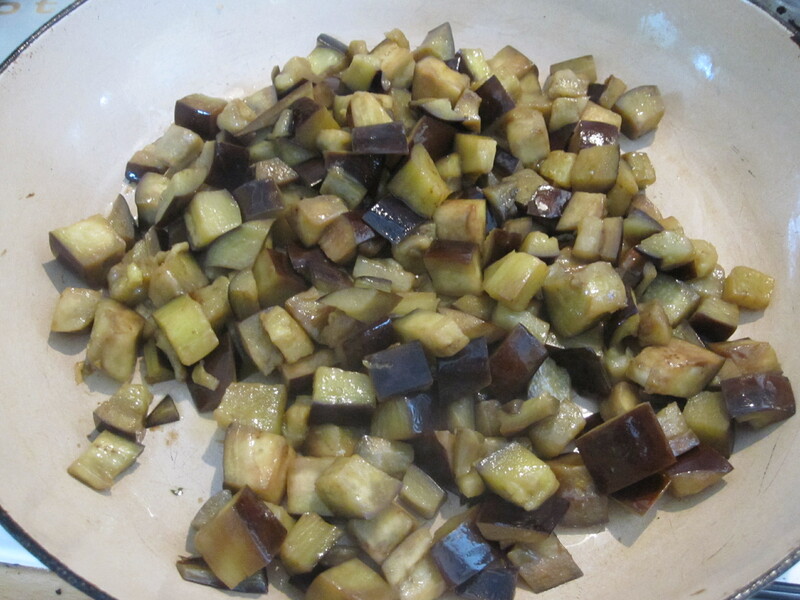 Heat 6 tablespoon olive oil in a large pan and then gently fry the aubergine. It will soak up the oil very quickly but just keep gently stirring and eventually all the pieces will nicely brown. Remove to a plate. Now add a little more oil to the pan and gently fry 1 roughly chopped medium-large onion till soft. Now add the blanched celery, 25g pine kernels, 200g tomato passata (you can buy in jar or tin in supermarket – or make your own! 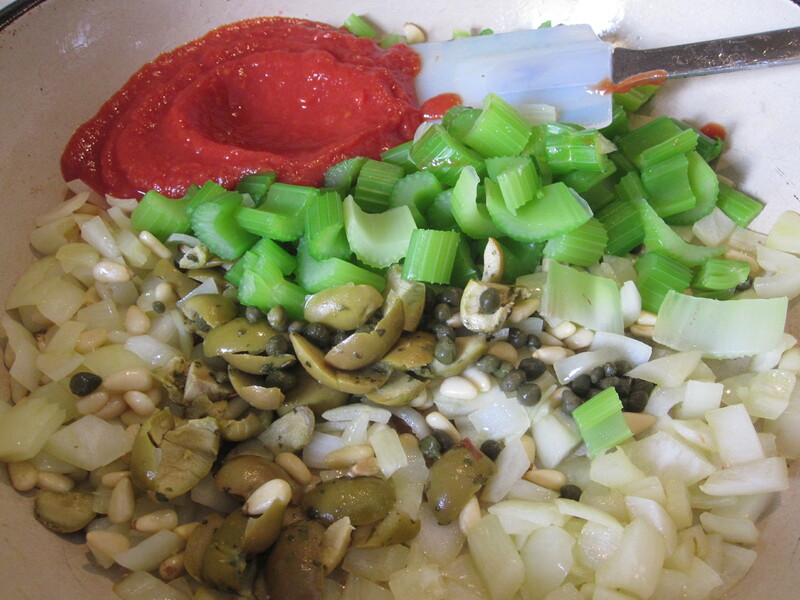 ), 2 rounded teaspoons capers and 40g pitted and chopped green olives (Sicilian if you can). Fry for another 10 minutes or so, until the celery starts to soften, stirring constantly to stop the mixture sticking to the bottom of the pan. Now add salt and freshly ground black pepper to taste, 1 tablespoon wine vinegar, 1 teaspoon sugar and half a bunch of parsley, chopped. 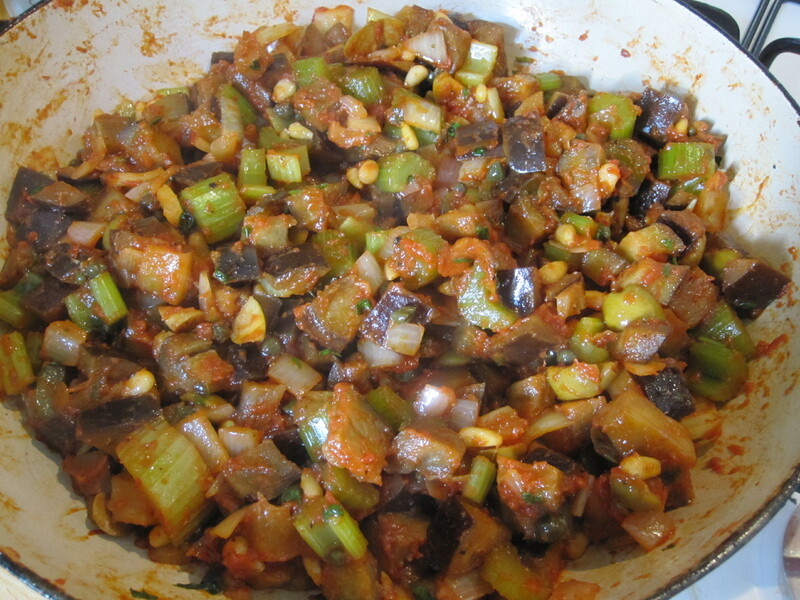 Return the aubergine to the pan and give it all a good stir and continue to cook for about another 10 minutes. If it’s very dry, loosen with a little hot water. Taste to check seasoning. Remember – taste, taste, taste, and get the flavour just how you like it. Transfer to a serving bowl. 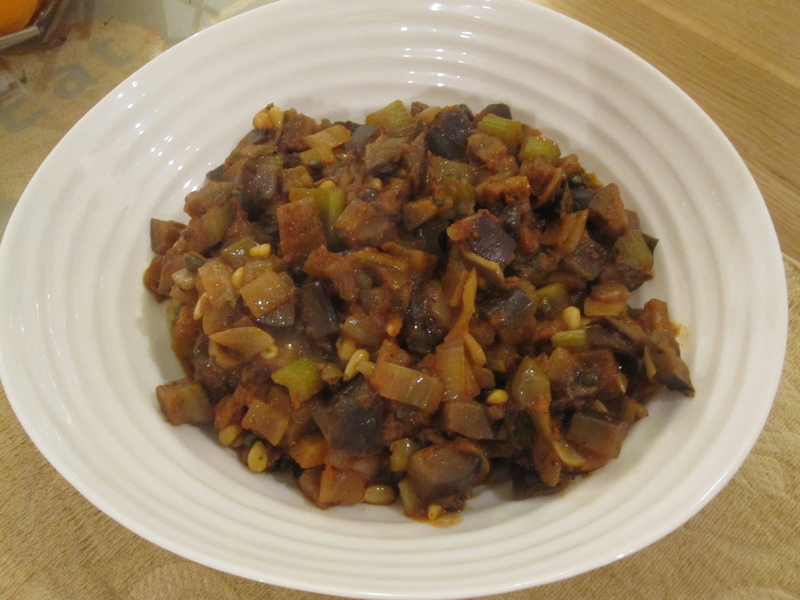 You can serve the caponata as a starter with bread, either cold (but room temperature – not straight from fridge) or warm; or you can serve it as an accompaniment to fish or meat. However you serve it, it’s a gorgeous dish and has that essential Sicilian sweet and sour taste – the vinegar and the sugar; and a harmonious blend of flavours from the aubergine, celery, olives and tomato. In Sicily Unpacked, Giorgio Locatelli talks about how every home and restaurant have their own version, so only use the recipe here as a starting point and put it together with a balance of flavours that appeals to you.